Coffee plays an important part in the life of most people, and a coffee-related gift is probably something that will make them very happy. 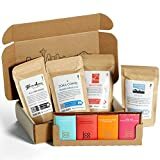 If you’re drawing a blank thinking of what to get the people on your list for Christmas, it’s safe to say that unique and attractive coffee gifts can make their day. Here are our top 20 unique coffee gifts that you can give the special, coffee-loving people in your life. Whether given alone or in a basket with other goodies, they’re sure to perk up the day of the recipient and help them enjoy the health benefits of drinking coffee. A sampler of four gourmet coffee picks is enough to brighten up your day. Get this set of artfully-crafted coffee blends, which could be one of the best coffee gifts for the giftee. These coffee samplers are from Seattle’s award-winning roasters and come in a gift box with tag. It’s a great gift for dads, colleagues, or just about anyone who’d love a great-tasting cup of coffee. 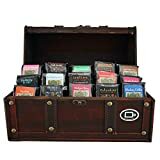 Each box of this Whiskey and Rum Barrel Aged Coffee Whole Bean Box Set includes one 4oz bag each of Uprising Coffee, Battle Cry Coffee, and Thomas Tew Rum Coffee in whole beans. These are individually crafted, single origin beans that are guaranteed fresh and maintain flavor longer than the usual beans to provide satisfaction with every cup. 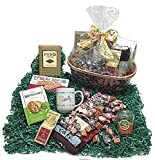 Make someone happy with this Coffee Lovers Autumn Gift Basket. This basket overflows with everything that will delight a coffee lover’s heart. 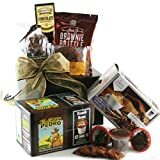 Columbian and Fresh Roast coffee beans, coffee-scented glass jar candle, biscuits, white chocolate cookies, caramel bars and caramel creams, and a coffee mug are inside, wrapped in a bow and ready for gift-giving. 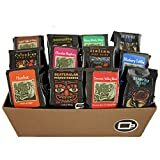 Another set of gourmet coffee designed to please the taste buds of discerning coffee addicts, this box of four gourmet ground coffee packs include 2.5 ounces each of Columbian Coffee, Classic Blend, Diamond Blend, and Gourmet Blend. It comes in a gift box in different colors, all wrapped up and ready to be gifted straight out of the box. Four flavors of gourmet coffee and four chocolate bars are included in this sweet surprise coffee gift box. A sampling of coffee beans from Seattle’s top roasters are paired with Jcoco cholate bars for the ultimate coffee experience. Coffee enthusiasts will surely swoon over these delightful combinations from Bean Box. Let your friends and loved ones indulge in this awesome selection of gourmet coffee flavors in one basket. Only the best roasts and flavored blends are included in this 12-pack selection. Each of these coffee flavors is freshly ground for automatic drip and makes one 6-8 cup pot of coffee. 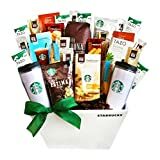 Surprise someone with all their favorite coffee gifts and stuff with this California Delicious Starbucks Daybreak Gourmet Coffee gift basket. 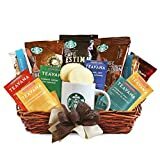 Included in the pack are three Starbucks coffee packs, a Starbucks ceramic logo mug, Nonni’s Biscotti, Walker’s Shortbread rounds, and 6 assorted Tazo tea bags. 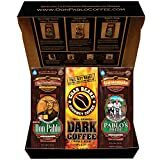 This coffee gift box sampler contains three popular coffee varieties in 12 oz bags. The custom printed Don Pablo graphics box is a gorgeous box that’s a gift in itself. A bag each of whole bean Pablo’s Pride Guatemala, Rocco’s Classic Italian Espresso, and Char Beanz Dark Coffee are included in the box. Never miss your favorite brew even when you are out camping with your friends. This coffee camp gift box brings together all your essential coffee accessories in a gift box. Inside are two enamel coffee mugs, coffee filters, Arabica beans, a portable pour over block, and a fleece blanket perfect for the cool chilly nights. Everything you need to enjoy the outdoors is inside this gift box. 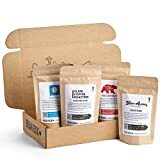 Drinking coffee can get you to different places around the world when you buy this Bean Box World Coffee Tour Gourmet Sampler. It contains 16 gourmet coffee samples from North and Central America, to Africa. Freshly roasted and packaged in sealed bags, each flavor is distinct and perfectly flavored. This beautiful gift box contains five 2oz packages of deliciously flavored Kona Hawaiian Coffee Blends. The platinum collection includes the famous Diamond Kings Reserve coffee. This gift box is great to give as gift for special occasions, ready to give out of the box. The perfect match – heavenly cookies and brownie bits paired with K-Cup coffee, makes this package truly heaven sent. The gift pack features a stylish gable box containing the cookies and brownies plus two boxes of K-Cup Coffee with 10 single serve pods in each box. 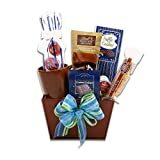 This attractive and enticing gift basket will surely bring joy to the heart and warmth to the soul. 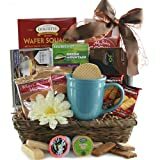 A beautiful willow gift basket contains an assortment of cookies, wafer squares, and biscotti to pair with the K-Cup coffee. Three boxes of 10 single serve K-cups complete the gift pack. 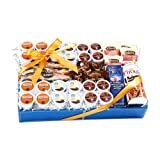 This wonderful Jumbo Coffee Lovers Premium Gourmet Coffee Gift Box Basket contains 25 items that are sure to excite the coffee lover’s heart. A pretty mug by LANG, 1.5 oz coffee packets in various flavors, 2 Door County Blender Ice Drinks, and many more are included in a sturdy gift box tied with a stretchy gold cord. The California Delicious Ultimate Coffee Lover’s Gift Box is a dream come true. It contains an assortment of sweet and savory treats that can be paired with a collection of Starbucks teas and coffee. The package is truly heaven-sent, and comes complete with a coffee press and Starbucks logo travel mugs. Another box of joy, this Deluxe K-Cup Coffee Sampler Gift Basket contains all the perfect snacks to complete your coffee-drinking experience. It comes with an assortment of 24 gourmet flavored K-Cups, Nonni’s Biscotti, chocolate-covered Grahams, Cashew Roca, Mandy’s Cookie Thins, and Pirouline Dark Chocolate. It’s a holiday treat that you can enjoy anytime of the year. Know anybody who is totally addicted to anything chocolate? This K-Cup Coffee Treat Gift Basket will surely bring happiness to them. It’s a collection of 4 gourmet K-Cups and their perfect match – Brown and Hayley chocolate covered graham, Jack Allen Chocolate dipped truffle cookies, Biscotti Brother’s Almond Biscotti, and Lindt Hot Cocoa Mix. A special coffee mug and ref magnet complete the package. Bring cheers to your coffee-loving friends with this Kona Hawaiian Coffee gift package, which includes custom coffee blend selections – Estate Blend, Kings Reserve, Certified Organic Tropical Arabica, and Surf’s Up! Get Your Day Started Breakfast Blend. It includes a selection of 20 Kona single serve cups in an attractive gift box. The cups are compatible for use with a standard Keurig K-Cup system. Enjoy your cup of coffee while reading this coffee book, The World Atlas of Coffee: From Beans to Brewing. This book by James Hoffman features how coffee is cultivated in different regions around the world, coffee history and politics, and every interesting topic related to this addictive bean. Make your own gourmet coffee at home and learn the step by step of proper brewing from this book by Brian Jones. You’ll also learn how to select the correct bean, the proper brewing equipment, and other coffee-making techniques. It’s a great way to enhance your love for coffee by preparing your own favorite blend and style. Learn more about your coffee obsession by taking a tour around the coffee capitals of the world and the different flavors, techniques and methods of brewing the perfect drink. 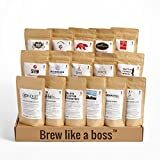 It also provides step by step instruction on how to prepare your own brew, complete with over a hundred coffee recipes for you to try. It’s the perfect book for every coffee addict out there to enjoy all types of coffee. Grab it on Amazon & Save [parcenta asin=”1465419551″]! All these coffee gift ideas are sure to excite the coffee lover in your life, including yourself. They make excellent coffee gifts for family and friends who need a boost of caffeine in their daily life. Mix and match these items and create your own gift basket, or give them straight out of the box; they are sure to be a big hit without a doubt. Aside from these, we also have more options for coffee gifts that you can choose from. 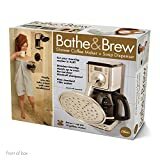 See More Amazing Coffee Gifts on Amazon! Previous articleWhat’s The Real Difference b/w French Press & Drip Coffee?